My thanks to the Friday Mashup team for choosing this as one of their Mashup Maven choices! I have said before how much I love that the Sale-a-bration offerings coordinate with catalog/mini products. The match-up between Sweet Summer and Elegant Soiree is one of my favorites! Time is running out to get Sweet Summer and the other SAB offerings so make sure you get this one before it is gone. You can click on the SAB icon on my sidebar for more details! This week’s Friday Mashup #35 is a sketch challenge. At first it looked to be a bit of a hard one, but the basics came to me pretty quickly. This was also supposed to be a card for Creative Sketches CS23C, a beautiful color combination. As I sat looking at my finished card I realized I forgot to add Bashful Blue. Ack! I was stamping on Sunday with my sweet boys running around so that probably explains the omission. 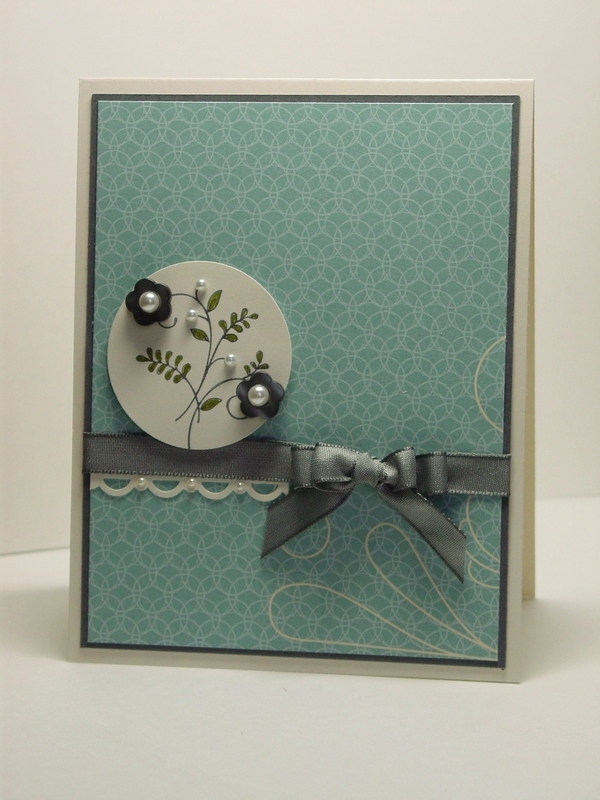 I started by stamping the branch on Very Vanilla card stock in Basic Gray. I colored directly pen to paper with Old Olive on the leaves then punched it out with my 1 3/4″ Circle Punch. 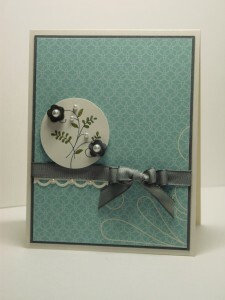 Basic Pearls were added onto the stamped image and then onto the Basic Gray buttons from the Neutrals Designer Buttons. Next, I chose a piece of the Elegant Soiree DSP that had a little of the leaf image in the corner and that dictated mirroring the sketch to make it work. I punched a little piece of Very Vanilla paper with my Scallop Trip Border Punch and added some of the tiniest pearls to it. The bow is made with retired Basic Gray Tafetta. Finally the stamped image was popped up on Dimensionals. It was nice to get some bonus stamping time this weekend and I look forward to a little more this week. Thanks for stopping in today and I look forward to having more to share soon! Have a great week! So pretty! I really like the pearls with that flower stamp. Elegant and beautiful! What a pretty card! I love how you used the colours and the sketch together!! Wow this came out great!!! I really love that grey ribbon with that DSP! Thanks for joining us at The Mashup! This is really pretty! Love the pearls on the flower and the scallop trim border! Very sweet and demure card – makes me want to carry a lace hanky and wear white gloves. beautiful! Love how the circle highlights the image—very elegant. So elegant! Love the simplicity of the design and the special touches. Love this card Jen!! Great use of colors and elements!!! LOVE THIS CARD!!!! So pretty! I am not sure how I came across your blog, but I am glad that I did!! !